Here are ten challenging problems that involve exponential & logarithmic expressions. The problems are not in any particular order (e.g. difficulty). You can download a document with the problems (and answers) using the link below. 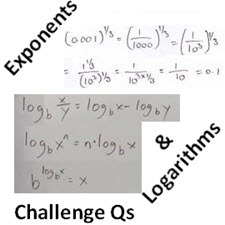 Exponents & Logarithms - Challenge Qs1.Given that x=(log82)(log28) , find the value of log3x .2.Given 4x2x+y=8 and 9x+y35y=243 , x, y∈ℝ , find the value of xy .